Consumers have never had it better. Shoppers today can demand and expect solicitous service, a huge selection of products, low prices, and more information than ever before about the products they consider purchasing. Digital devices combine with rich online retail platforms like Amazon.com to make the contemporary shopping experience not only more rewarding, but also a continuously evolving thing for which the ever-shifting goals and needs of buyers set the direction. Understanding how today's shoppers think and go about their purchasing decisions and where they are headed next is one requirement for serving them well. Being ready with a flexible platform and product content that exceeds their expectations and accurately anticipates their future needs is the other key to securing sales. Where They Start: Google and Amazon.com combined to serve as starting points for nearly nine in ten online shopping sessions initiated by survey respondents. Among those who started off on Amazon, only a small fraction ended up making their purchases elsewhere. Google shoppers flipped that balance, with a small minority making use of options like "Purchases with Google" ads that cut out the usual intermediary. Only about one in fourteen respondents started shopping at sites other than Amazon.com or Google.com. The Devices Shoppers Use: Even if consumers over the age of 60 still incline toward laptop and desktop computers for online shopping, all others rely heavily on mobile devices. Among respondents aged from 18 through 29, a full 84% reported regularly using a mobile device like a smartphone for online shopping. While that figure tapered off somewhat among older respondents, even 45- to 59-year-old mobile device users remained firmly in the majority. 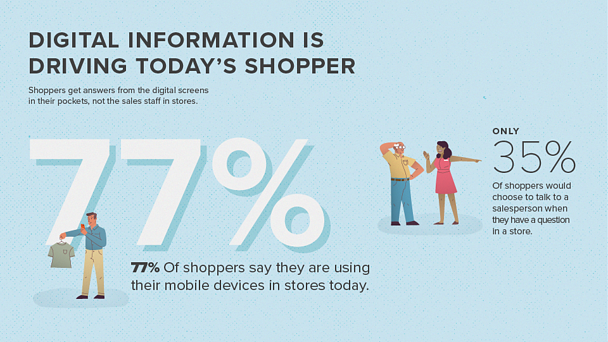 How Mobile Devices Influence In-Store Shopping: Mobile devices have become every bit as important when shopping in store, too. Almost eight in ten respondents use their mobile devices to help with making in-store purchasing decisions, with only about a third today asking for help from salespeople. In-store shoppers prize how mobile devices let them easily compare prices with competitors, read product reviews and descriptions, and share product information with others. Some even buy online using a mobile device while standing in a local retail store. Product Content is King: Whether for in-store or online shopping, consumers seek and value strong, informative digital product content. A striking 87 percent of survey respondents rated product content as "extremely important" or "very important" to the buying process. Seven in ten wanted to see at least three photographs of products they were researching, with 86 percent hoping to read three or more product reviews before making a purchase. These preferences held up across product categories ranging from clothing and electronics to online groceries, with only price ranking higher in importance. While having enough high-quality product content is already important, it will therefore only become even more so. Likewise will the need to gracefully accommodate mobile devices and feature prominently on Amazon and Google become even more crucial over time. Try Salsify's free Amazon Product Content Grader to see how your pages are performing today to start planning your strategy.